In order to remain fit and exercise regularly, it is very important for our body parts to be fully active and strong enough. This helps them to cope up with the extra stress that our body experiences when we are working out in the gym or home. Strong body parts and especially legs help an individual to recover quickly and continue his normal day to day functioning after each day’s workout. Ankles are an important part of our legs and should be strengthened for better performance. You can follow these 6 exercises on how to strengthen your ankle and stay fit always. This is one of the best exercises to strengthen your ankles. Sit down on a bench and make your feet touch the ground firmly. Slide a jump rope under any one foot tightly. While you are holding the rope, pull the rope towards your left side so that the ankle too tilts towards the left. The force which is caused by your arms will turn your ankle left but you need to go against it and push your ankle to the right side. This will result in your ankle tilting to the right. In this position, pull right and push the ankle towards the left. Practice with other foot. Repeat this exercise 8 to 10 times. Sit down on a bench and cross your right leg over the left one. Now use your left ankle to trace all the alphabets starting from A and ending at Z. You should imagine that your toe is a writing tool and you are using it to form the letters. When done with all the letters, cross your left leg over the right one and repeat the same exercise with the right ankle. Take an old belt around both the ends of a dumbbell which is light in weight. The belt should be so tied that a triangle gets formed when the belt it held in the centre. Sit on a bench and insert any one foot into the triangle and lower it down with the help of the weight. You must ensure that the belt is just below the toes. With the help of your ankles, lift the weight again and again till your ankles get tired. Repeat with the other foot. Stand straight on the ground and ensure that your feet are completely parallel to the ground. Slowly raise both your ankles to such a point that you are left standing on your toes completely. Wait for 3 seconds and then go back to your normal position. Raise ankles again and continue this exercise till fully tired. Sit down on a bench. Keep only your heels on the ground and slowly tap the toes upwards and downwards continuously for 45 seconds in the beginning. 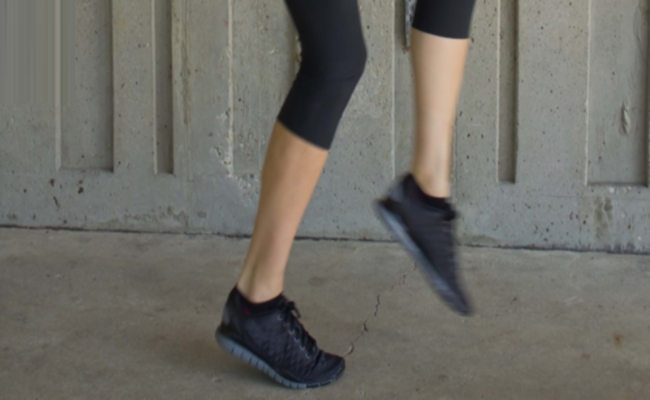 Slowly increase your stamina to one minute and tap each ankle steadily. Gradually you will see that you can increase the time that you tap for and also the speed with which you do it. Stop when tired. A jumping rope helps to make those muscles and ligaments strong which support our ankle and thus help to strengthen it to a great extent. You can practice 50 to 70 repetitions of a jumping rope every day to get strong ankles which will not get strained easily.